(Breskens, The Netherlands)- The 2018 J/111 World Championship was hosted in conjunction with the Breskens Sailing Weekend in the Netherlands. A dozen J/111 crews participated from five nations (Belgium, Great Britain, Germany, Netherlands, & Switzerland). The teams raced offshore on the North Sea along the famous Benelux beaches and seashore. Hosts for the Worlds were Watersportvereniging Breskens, Royal Yacht Club of Belgium, Koninklijke Roei & Zeilvereniging De Maas, Koninklijke Nederlandse Roei en Zeilvereniging Muiden, Koninklijke Antwerpse Watersportverenging SRNA and the Royal Netherlands Yachting Union (RNYU). As anticipated, the powerful British J/111 contingent would prove formidable over the course of competition. 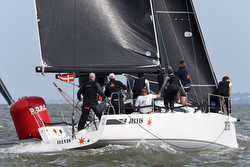 In the end, it was Martin Dent’s JELVIS that loved the big breeze and big winds and repeated their win from 2016 to be crowned the 2018 J/111 World Champion. The first day of competition was already going to separate “the men from the boys” due to the big breeze, big waves, and difficult steering conditions in the chop that builds offshore of Breskens due to the current. For those that relish the breeze (e.g. like the Solent sailors), they had a lot of fun offwind in the planing conditions. The second day produced even tougher conditions than the first, with a steady 20-plus kts of wind and huge waves. Spinnaker runs saw boats easily hitting 14+ kts boat speed most of the way down the track to the leeward gates. Dent’s JELVIS team scored an impressive, perfect 1-1-1 on the day. The only downside was that Simon Bamford’s team on KESTREL had a massive collision with RED HERRING during the first race of the morning. On the third day, the windspeed was gusting up to 23 kts and waves up to 8 feet high against the current! Britain still ruled after three days of racing, with Dent’s JELVIS in an untouchable position for the final day. 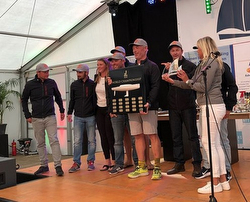 In the end, the JELVIS crew won their second J/111 World Championship with a very consistent performance, reveling in the breezy, choppy conditions. Taking second was Tony Mack's McFLY and the battle for 3rd place was won by the “Flying Dutchmen” aboard Paul van Driel's SWEENY (they were also declared the J/111 Worlds Corinthians Division winner). For more J/111 World Championship sailing information Add to Flipboard Magazine.